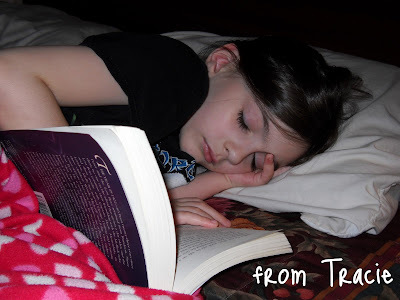 From Tracie: Just One More Chapter? When I was a kid, I always begged to stay up and read "just one more chapter" when my mom would come in to turn the lights out. I also spent many nights hiding under the covers with a flashlight after she left enjoying more than one extra chapter....until the time I was caught and all the flashlights were taken away from me. Sometimes I would fall asleep reading, and when my mom came in the room to check on me, she would slide the book out of my hands and put it on my bedside table. This drove me crazy, because she never put the bookmark in before she closed the book. Katarina is a book lover. Last night, after several "one more chapter" extensions, I went to tell her that it was lights out time. For the first time, I found her laying with her book, asleep. Naturally I did what every book lover mom would do, I grabbed my camera to capture the moment. On the way I told Thomas the story of how my mom always forgot to mark my place before she closed the book. She isn't a big reader, and I think it never occurred to her that it would be important. I gently slid the book out of Katarina's hand, marked her page, and set the book on the bedside table. Before turning out the light, I stood there for a few minutes marveling at how much she has grown. It was one of those moments when I looked at her and didn't see my little girl, but saw a glimpse of the person she is growing up to be. As I leaned over to turn out the light, she stirred and caught me standing there. "Mom, where's my book?" "Shhh honey. You fell asleep, I put it on the table and you can read more in the morning." She started feeling around on the bed and sitting up, "What about the bookmark? Did you mark my page?" "It's okay. I marked your page." "Was I at the end of a chapter? I always like to stop at the end of a chapter." "Don't worry, it will be there when you wake up, exactly where you left off." I'm secretly loving that she is growing up before my eyes, and also wondering if she is loosing all of her littleness. "....Mom? Will you lay down and cuddle with me for a few minutes while I go back to sleep?" My girls are avid readers as well. Did I leave a comment already? This is so cute! I love this post. Makes me want kids....the cat doesn't respond back! lol! Gorgeous. I love how well the two of you know each other. I, too, read with a flashlight. Every night. This is so sweet! Aren't you proud of your little reader? Simply adorable Tracie! It must have been a mothers reminiscing night! (I sent my son a poem last night after thinking how much he has grown up!) Time just flies! Ahhh... how precious is that!!! So touching! Beautiful closeness between you and your daughter. Enjoy every second! They grow up so fast. It's very nice to read this. I know most survivors didn't have this experience. This is why I make my best effort to be a parent like you describe here... hmmm... motivates me to share some of my parenting experiences... i could write lots of blog posts about them. Thank you! It was very sweet! The last part is the best part --- glad you got some snuggle-time. So sweet and that was totally me last night! I fell asleep with my head literally in my book!! Love it! I was that reading girl, too. I couldn't get enough. How very, very sweet. That is just a splendid picture, one you're going to have to save for her. It speaks volumes for her love of books. Good to be a reading girl! I still stay up too late reading. I secretly hope my son does, too! So sweet. That's a big book for such a young girl. My boys used to love me reading out loud book series to them. When my oldest started reading them on his own I was thrilled. I was much the same way. I loved falling asleep with a book. It was one of the few things that kept me from being scared at bedtime. She is so beautiful and obviously a good reader -- the book is bigger than she! And don't worry, as long as she still wants cuddles, she's not lost her "littleness". Awww so sweet. I was the same way and so is my daughter. I too, mark her place so she won't lose her spot. There's something so beautiful about this post. I saw myself in it, and how I'd feel to see my daughter finding that love, the same as I did - those moments are truly special! Beautiful story. It's tough to get upset at your kid for staying up late reading. Especially when you share that love. so sweet! i still fall asleep with my face in my book. Now my sweet hubby marks my place. :) And your right ... in the blink of an eye they are too big! This is one of those "awww" posts that make you feel warm inside! She is so beautiful and how wonderful she's a reader - me, too. You should see my library hubby built me for all my books! Now that's love (he's not a reader)! Good posts and Happy SITS day! !